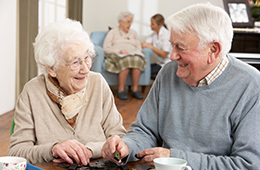 At Mayflower Gardens, we believe in caring for our residents with dignity. Our community is staffed with compassionate medical professionals, and we provide short-term care and recovery for patients after surgeries or suffering from long-term illnesses. Our nursing services are multifaceted. Our nurses take care of the residents medically, emotionally, and physically. Our licensed nurses manage, observe, and evaluate each resident’s care with compassion and understanding. Our restorative nursing and rehabilitation team is made up of registered nurses, licensed practical and vocational nurses, physical and occupational therapists, speech-language pathologists, and audiologists. All of the members of our rehabilitation team work together to promote independence, safety, and they help each resident attain their highest functional ability. Mayflower Gardens Convalescent Hospital is part of Retirement Housing Foundation, a national, non-profit organization.